I’ve seen a multitude of these posts scattering the blogosphere, however they have all been different so I thought I would share my picks with you too to show you how I like to rock a dark and sultry lip at this time of the year! Ive picked different finishes and also some lighter shades too for those of you who don’t want to wear a berry lip in the day or to work for example. If you prefer a more purple based colour then Benefit’s No Competition is perfect, however I am really disappointed to say that they have discontinued it! I have yet to find any lipstick formula that I like more than this or a colour that comes close to this one so I had to include it in the mix for those reasons! If you ever see this in a blog sale or on eBay, snap it up! You will not regret it, I promise you! The only one I have in my collection that is close to this is No7’s Moisture Drench Lipstick in Cranberry. It’s also is only £9.95 so it’s quite a bargain! Boots are also giving out the £3 off No7 Makeup vouchers at the moment so its worth picking one up for Autumn and Winter! Finally, for those of you who don’t feel comfortable wearing such a dark colour in the day or to work then you should try one of the two options I have included in this post. Again, there is a budget and a more expensive ‘dupe’ to suit everyones bank balance! 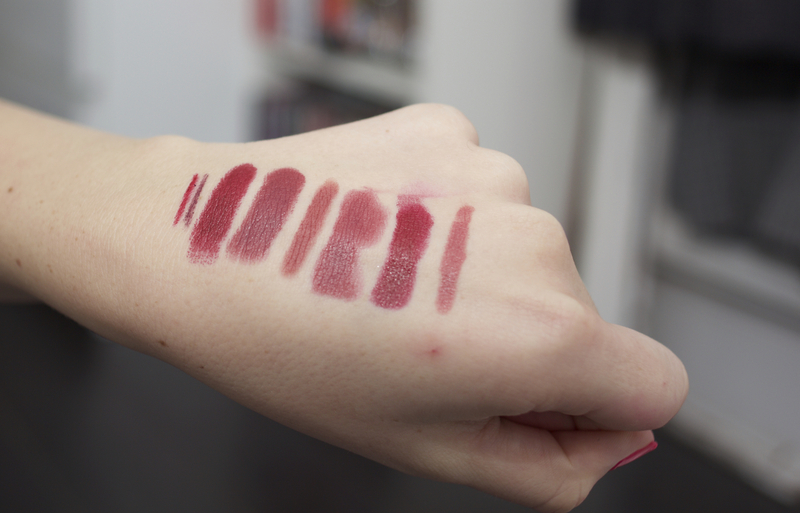 I didn’t plan the post to be like this but when I put all the lipsticks together I realised I’d done it by accident! The high end option is one of NARS’s Velvet Matte Lip Pencils in Walkyrie. Its a beautiful deep rose matte shade that looks very Autumnal when on the lips. A more budget-friendly option is Soap & Glory’s Marvelips which is a dual ended pencil that is designed to create full looking lips. As you can tell I have used a lot of this and I really like the way it makes my lips look! I also decided I needed some lipliners to go with the darker shades and headed to my local Superdrug to check out the MUA offerings as they are only £1! I thought I had picked up two lipliners but the shade Berry Wine is actually an eyeliner! Oops! However, I have used this on both my lips as a liner and my eyes and I love the way it works for both. I actually was tweeted by MUA to say that a lot of their customers use this as a lipliner too so at least i’m not the only crazy one! I hope you like the colours I’ve chosen, let me know if you have tried any of them and which one is your favourite! 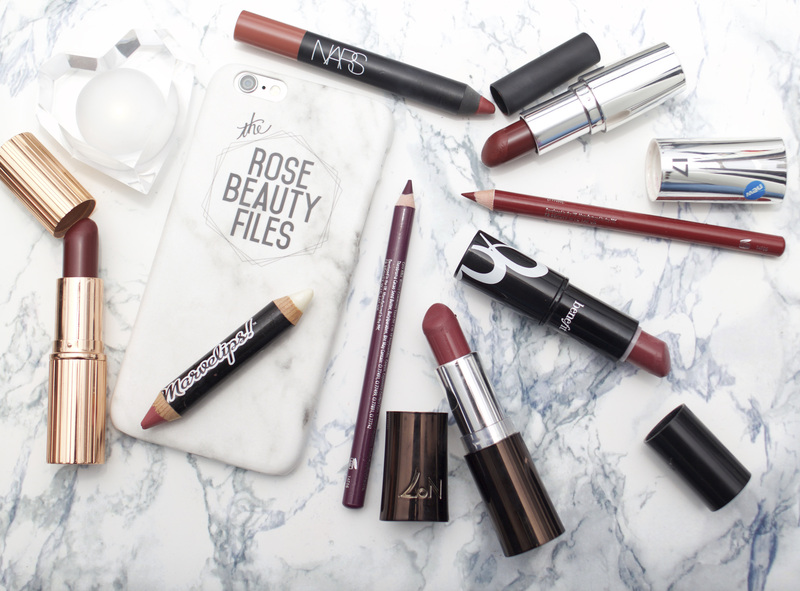 What lipsticks are you loving this season? P.S – Sorry some of the pictures look like I’ve applied the lipstick blind folded, by the time i’d done six my lips were really sore!! Fab picks! That Nars lip pencil looks gorgeous! It really is, I think you’ll love it! I loved your picks! The No7 lipstick looks gorgeous! Its such good value too! Particularly if you take advantage of the offers and coupons! Gorgeous photos! I’ve been eyeing some new Charlotte Tilbury shades…my current fave is Glaston-berry! I don’t care about the price point, I actually quite like both the Soap & Glory and Seventeen picks! Ooh that’s good! I’m Glad! The Seventeen one is a beautiful colour actually! I always get complements on it! Thanks for stopping by! Gorgeous picks!! My favourite is Soap & Glory – Marvelips! the first lipstick looks amazing ! !